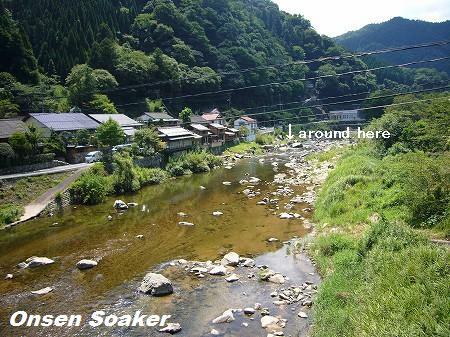 onsen soaker: Rotenburo, Izumoyumura Onsen, Unnan City, Shimane Pref. Rotenburo, Izumoyumura Onsen, Unnan City, Shimane Pref. History of Izumo Yumura Onsen (出雲湯村温泉) in Shimane Prefecture dates back to 8th century but it's a very quiet small onsen area now. There are two onsen inns, a public bath house, and a natural soaking pond called just "rotenburo" (open-air bath) on the riverside. This pond is my favorite. It's easy to find. There are steps to walk down to the river shore just 20-30 meters from the public bath house. You'll see small bubbles come up from the bottom sand in the pond. Yes, it's ideal temperature at around 40°C. River Hii (pronounce HEE) and Izumo Yumura Onsen. 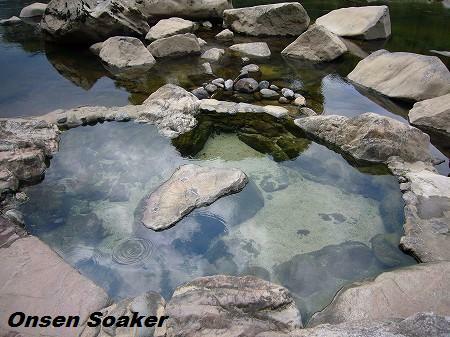 If you get to the Izumo Ymura Onsen, the rotenburo is easy to find. There is no changing room and other facilities. Closing optional. I couldn't find a notice to ban swim suites bathing, but I heard local people doesn't welcome visitors' swim suite bathing. I recommend you to visit in the night or early morning. Close up of the roenburo. 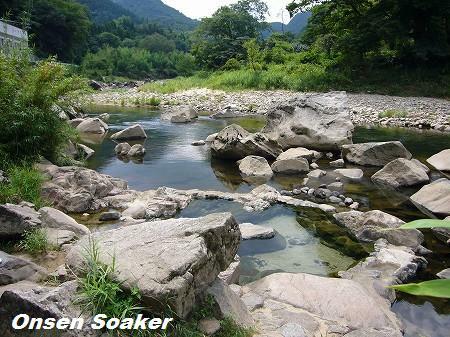 Onsen is gushing from the bottom sand. Access: Take a bus from Kisuki Station of JR Kisuki Line to Izumo Yumura Onsen. The bus and railway services are both sporadic. From the bus stop, it's a few minutes walk. That looks great. I traveled somewhat near there last year and I'm kicking myself now that I didn't know about it! It's easy to find. Don't miss when you visit Izumo area next time.